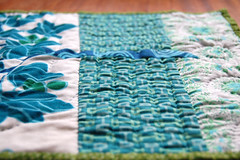 i think i’m officially hooked on quilting. i haven’t enjoyed making anything as much as this for a long time. it’s a belated (natch) mother’s day present, all hand stitched. 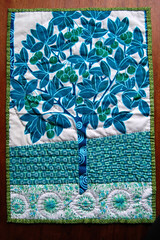 the tree fabric might look vaguely familiar - it features in my banner. the design has four different trees but this one is my standout favourite. it’s quite a crowded pattern and you can see the odd leaf and trunk from its companions peeping in around the edges. 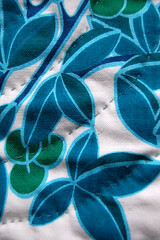 i cut out and appliqued the trunk while keeping the fabric in a single piece. in some ways i’m not totally happy with the “chopped off” appearance of the tree around the leaves and especially at the top, but it was necessary to keep it visually isolated and in other ways i’m pleased with the way it gives a rather more abstract, textural feel to the whole thing, rather than “oh look a lollipop tree”. the chopped-offness adds to its overall slightly drunken air. the “grass” was supposed to be at an angle - and had to be to cover up other trees - but the “flowers” should be straight. that’s just not enough care at the piecing stage to get them lined up right. i wasn’t totally sure about including this fabric as it’s a different style print to the others and the whole “flowers” thing is a bit literal. but i really like the way the colours play - i think the white background balances the piece - and i like how it echoes the circular motif of the tree. 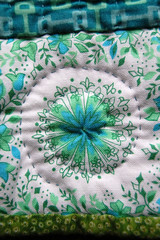 i have so much still to learn about using fabrics together in patchwork, but it’s really fun learning. but nothing worth learning comes immediately and i enjoyed it so much i can see me taking every opportunity to practice, especially on manageable sized projects like this. oh and yes, i've learned pretty much everything i know so far from the purl bee, their tutorials are beautifully clear (as well as clearly beautiful). and to give more credit where it's due the whole idea was inspired in no small part by liesl and alex .